A finely worked scroll with long, thin tendrils and trefoil leaves, partly interlaced, is embroidered in brown with white outlines. The fabric is sewn together from two parts, and the embroidered part has a linen backing. A flat seam connects the two parts, with piping in a fabric woven in blue and white checker. It may have been part of a tent or had a similar outside purpose. The radiocarbon date for the fragment is 1417 AD +/- 33. The asymmetrical character of this beautiful flowing design is surprising because others of the period are almost invariably balanced on both sides. Possibly the fragment is just half of a larger pattern with a mirror image providing a symmetrical whole. The fragment is puzzling in other respects as it is one of a group, all worked in the same stitch and through double layers of fabric, but it has not been possible to identify what garments they once decorated. The date of this embroidery, too, is uncertain but the inspiration could have been the graceful floral scrolls found as background decoration on 14th century illuminated Qurans. 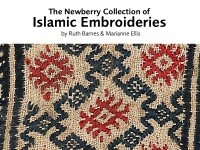 Slanted buttonhole stitch is admirably suited for embroidering this flowing arabesque design with its exaggerated tendrils, pointed leaves and tiny buds. In the detail illustrated here, it is possible to see how the worker has placed the stitches closely together and adjusted the slant of the stitches to intensify the rhythm of the curves. Like all freehand stitches, the size and direction of the stitch can be varied at will to suit the marked pattern, whereas counted thread work embroidery is circumscribed by having to stitch over and under a chosen number of warp and weft threads. The detail demonstrates the versatile nature of slanted buttonhole stitch; it was used on attractive embroideries made in Rabat (Morocco), from the 17th century onwards.